The IGL project series on the stability of quasicrystal frameworks began in 2014 with the completion of a proof of Wester's Conjecture in 2D, illustrated by the Wester Game. It was continued the following year with progress on a 3D generalization, culminating in conjectures supported by experimental software, but only for special cases of the crystalline structures (rectangular clusters of cubical cells) and restricted deformations (those that preserve the planarity of the faces of the the rhombic hexahedral "brick"). This 2017, two groups of five students, each worked on building software for further explore the 3D problem in particular the case of general Penrose quasicrystalline clusters and some progress on the most general case that the deformation group includes twists and asymmetric shears of (still) cubical frameworks. Members of the advanced group made significant progress in four areas of the general problem to be solved. Sasha Lamtyugina continued the work of earlier students by re-implementing the DeBruijn-Robbin generator of 3D quasicrystal clusters into Python/OpenGL. 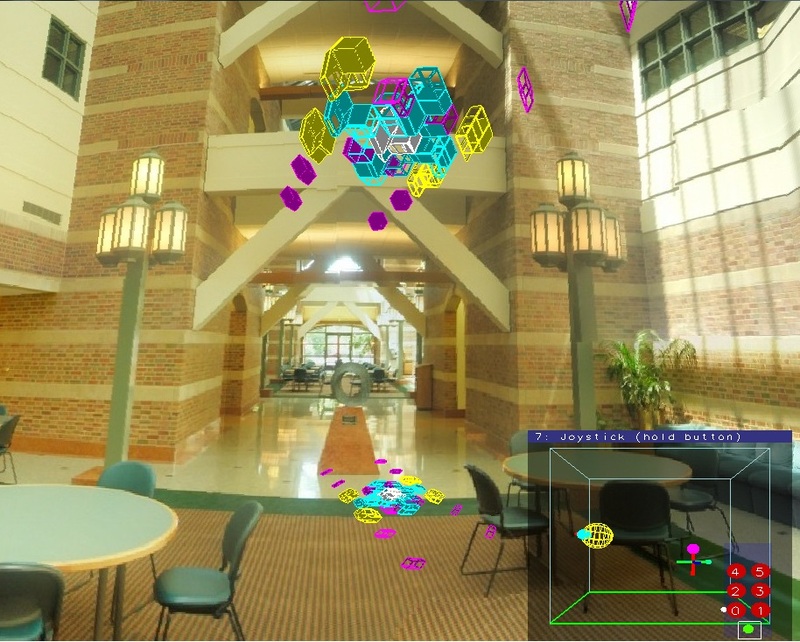 This software was originally programmed in Schaeffer-Crowell's Syzygy, which is the distributed graphics software for the virtual environments (CAVE, Cube, Oculus Rift) of the (now destroyed) Illinois Simulation Laboratory (ISL) of the Beckman Institute. Yijing Chen implemented the three projection panels for the testing of the Duarte-Francis Shadow Conjecture generaliziging their proof of the 3D-Wester Conjecture. Arturo Guerrero worked of the shift deformations for the stratification of arbirtrary rhomboid (Penrose) clusters, generalizing the Baglivo-Garver (cubical crystalline framework) shifts. And Zachary Berrebah explored the conjectured elementary generators of the deformations of a cubical framemework in 3D.